Many readers probably remember the story of Major, the German shorthaired pointer who got lost in December in Elgin, OK. When the owner asked the city’s ACO about her dog, he offered up assorted lies, making her suspicious. The owner ultimately went into a pit of dead animals she found at the shelter and discovered the bloody remains of her pet, whose ears were missing. The city closed the pound and put ACO Daniel Linthicum’s contract on hold while the matter was investigated. [D]octors could neither confirm nor deny the actual cause of Major’s death. 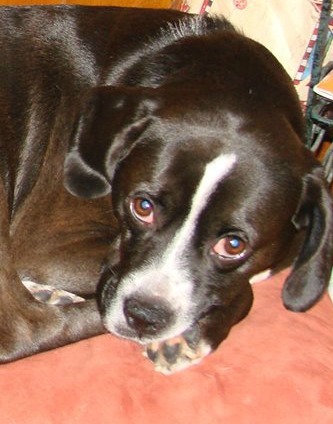 But, they did determine Major had cancer in both lungs and was in bad health. They also determined the other dog had a whole ear and a piece of an ear in his stomach. The attacking dog ate the ears? I’m no expert but that doesn’t sound like any dog fight I’ve ever seen. 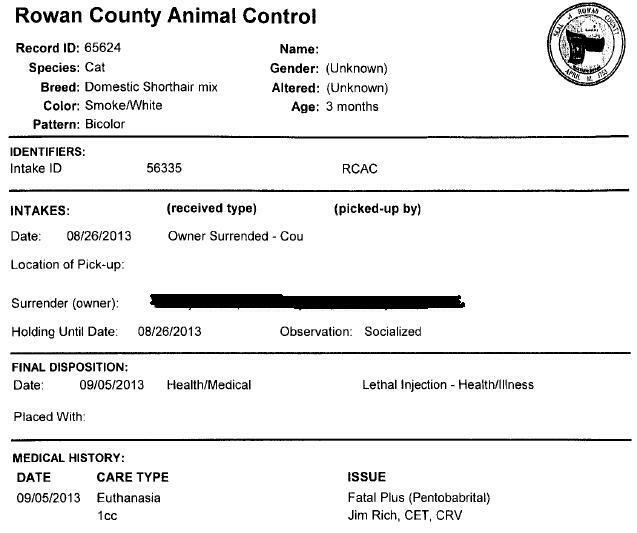 During the investigation, it was discovered that neither the City of Elgin nor [Daniel] Linthicum had a shelter license through the state. A shelter license is required for any place housing 10 or more animals. The findings of the investigation were presented to an assistant district attorney twice, who declined to file charges. Gassing of animals in some sort of Rube Goldberg device using truck exhaust is horrifying. But to make matters worse, Major was severely compromised, clinging to life and likely gasping for air with cancerous lungs at the time he was gassed making it probable that he suffered even more than the typical victim of such a barbaric killing method would. I don’t know what sort of shape the other dog was in at the time but if a private citizen committed these acts there would be criminal charges. And despite the city promising it would hire a new ACO, Linthicum is back on the job picking up animals, focusing mainly on wildlife and only handling pets in emergency situations. Because he’s demonstrated he handles those really well. The next city council meeting in Elgin is February 10. Please for the love of popsicles let someone show up to talk some sense into the asshats paying this guy. There is something so obviously wrong here that Scooby Doo could solve the case all by himself. Taxpayers deserve better. They need to stand up and demand it. 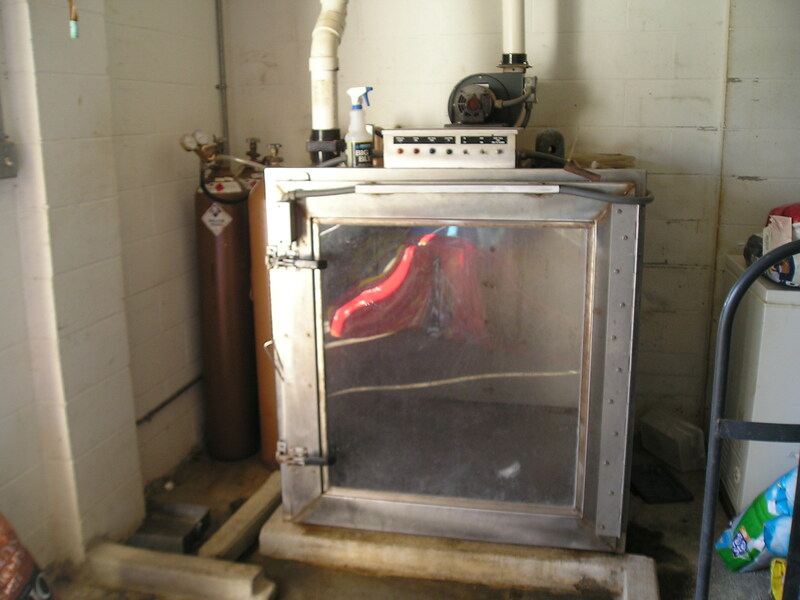 A gas chamber for killing shelter pets, no longer in use. On December 4, 2014, the Animal Welfare Section of the NC Department of Agriculture issued a policy statement regarding the use of gas chambers to all licensed euthanasia technicians and registered shelters. The letter can be read in full here. Licensed euthanasia technicians are requested to contact the Department of Agriculture prior to gassing in order to explain the circumstances and see if the director of Animal Welfare agrees that the case qualifies as an exception. Any facility which anticipates it won’t be able to stop gassing pets by February 15, 2015 has until January 7 to file a one-time extension request. Paws Up to the NC Department of Agriculture for taking action to drastically reduce the conditions under which it will be legal for shelters to gas animals to death. It’s not as good as a ban, but it’s a solid step. Paws Down for only doing it after the AVMA, the gas chamber’s last champion, finally arrived in the 21st century on the issue and stopped endorsing it for routine pet killing. No other major animal organization approves of gassing shelter pets. How many more years until the AVMA crosses the gas chamber off its list permanently? Warning: Dead pet photos below text. Do not scroll beyond text if you wish to avoid. 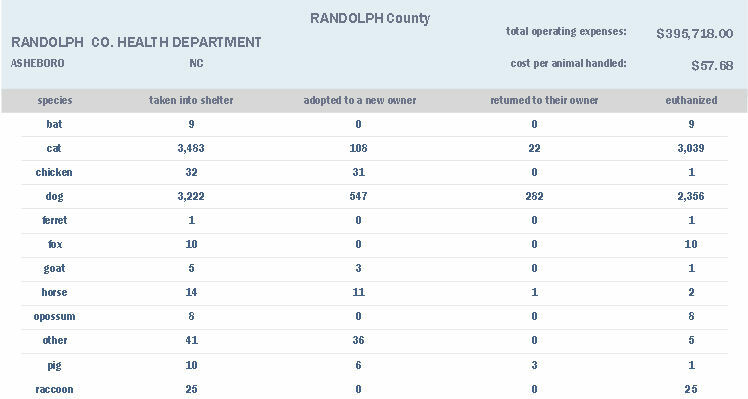 In 2013, the Davidson Co pound in NC took in 3440 cats and killed 3167 of them. The facility took in 3319 dogs and killed 2322 of them. The pound also took in 8 bats, 3 foxes, 6 raccoons, 1 skunk and 1 snake and killed them all. The Davidson Co pound is a gassing facility. Some of you have likely seen photos of the dead pets on the NC highway after they fell out of a truck transporting them from the Davidson Co pound where they had been killed. The photos were initially posted on Facebook by a concerned citizen who thought a pet killer was at large in the community. It was later confirmed that the Davidson Co truck’s tailgate had come open while transporting the carcasses. This is the leadership in your animal “shelter” Davidson Co. The concerned citizen who photographed the dead pets was correct – there is a pet killer at large in your community. And you’re paying that person’s salary. Davidson Co, get rid of this pound director and start fresh with someone willing to do the hard work of saving shelter animals’ lives like they do in hundreds of other open admission shelters across the country. The tools are available today, for free. Why not try? I don’t think there’s any chance you could possibly do worse. 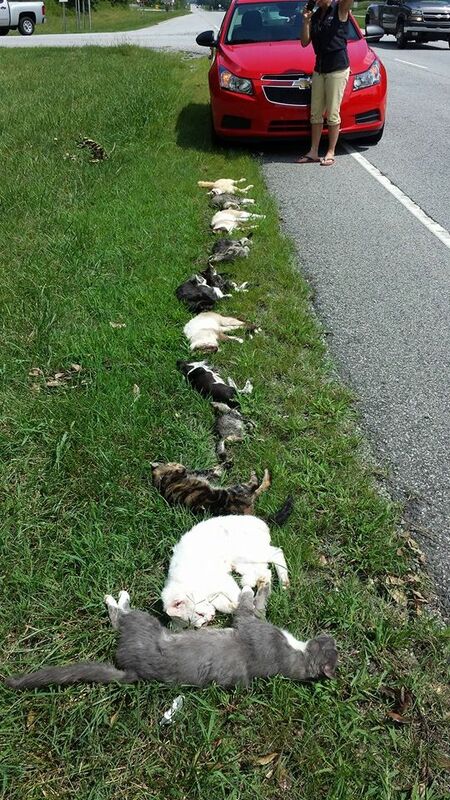 Screengrab from Facebook showing a trail of dead pets on a NC highway. Screencap from Facebook showing the deceased pets removed from the highway by the so-called irresponsible public in an effort to give them dignity in death. The Ohio SPCA has been trying to get Hocking Co to stop gassing animals for years. But the county has fought, both in court and in the court of public opinion, to keep gassing. After all, the county’s gas chamber is homemade and everyone knows homemade things are the best. This month, the 4th District Court of Appeals ruled in favor of the Ohio SPCA and ordered the Hocking Co dog warden to stop gassing animals and start killing them via injection. The dog warden is already certified to kill animals by injection, it’s just that he didn’t feel like it, because who would when you’ve got a homemade gas chamber to play with? A former assistant Dog Warden and humane agent, Chris Vickers, testified that when they were in the gas chamber, he heard dogs “screaming like they had been hit by a car and injured”. Gassing took several minutes and was not always effective in causing death. He would see dogs struggling, fighting, urinating and defecating on themselves. He routinely found blood, bite marks, feces and urine on their bodies when he removed them from the chamber after gassing. “Not always effective in causing death” sounds like some pets were still alive after being tortured in the Hocking Co gas chamber. Those animals were presumably put back inside for more torture until they finally died. Yeah, I can see why the county is so head over heels with this thing. The county lawyer argued that killing animals by injection is stressful for both people and animals. No mention was made of the stress from working in a place filled with carbon monoxide fumes and the sounds of pets being tortured to death. Also: homemade! Like on Etsy! Hocking Co has 30 days to appeal the ruling to the Ohio Supreme Court. When contacted by the local news for comment, county officials hid. The ruling may force other counties in Ohio to stop gassing pets as well since they too must comply with state law ensuring humane death for animals. The gas chamber is not humane and the recent court ruling upholds that. Let’s be clear: Killing healthy/treatable animals for convenience is not in any way humane – even if it’s done by injection. But for rare cases when euthanasia is warranted to end the suffering of a medically hopeless pet, the most current humane method should be used. Thankfully, many communities have ended the practice of convenience killing in their open admission shelters. Hocking Co could join them, assuming the dog warden and county officials have stopped crying in their beer over the loss of their beloved torture device. The next time you see a cat hater spewing misinformation about how cats kill zillions of birds, remind them of the verifiable fact that the US government killed 4 million animals, mostly birds, last year. That number includes tens of thousands of beautiful Canadian geese. The government’s only criteria for killing appears to be a complaint from someone/anyone describing the birds as a nuisance. And the killing is done in the cruelest of ways, as detailed in this recent story from Youngstown, Ohio. Two hundred thirty-eight adult geese and their babies were targeted for extermination at Mill Creek Park. 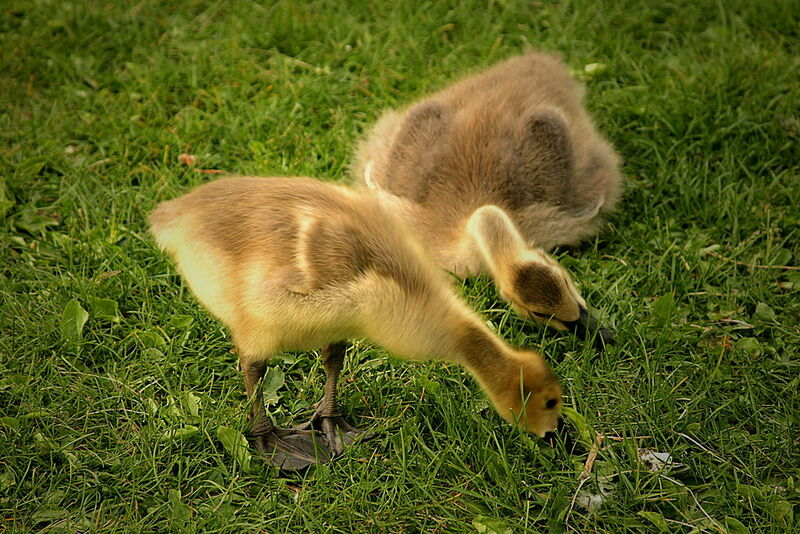 Wildlife officials waited until June to kill the geese since they are most vulnerable at that time – the goslings are too young to fly and the adults have temporarily lost their ability to fly due to molting. Unable to escape their killers, these adult and baby geese were herded into a chamber and gassed to death – an agonizing way for animals of any age to die. Let’s be clear: these are not fabricated numbers based on junk science like the now debunked cat claims, these are government reported numbers of kills. All done for convenience in the most horrifying manner imaginable. And paid for by American taxpayers. The feds seem to have something in common with local government run “shelters” with regard to convenience killing of animals – and that is not a good thing. In addition to the cruel treatment Bandit received as he lay dying, the ACO further tortured the pet by placing him in the gas chamber after returning to the pound. NC state law specifically prohibits the gassing of animals who are near death. I have a Rowan County Animal Shelter complaint. I tried to leave a message for Officer Staton but he has yet to return my call. January 9th, 2014 around 7:30 or 8 on 52 in Granite Quarry near Sides Auto I stopped to help a medium sized black/white male dog that had been hit by a car. He was partially laying in the road so I turned around, blocked him from oncoming traffic and applied my flashers. A passerby stopped to help me as I looked for the owners in the surrounding houses. In the mean time I called 911, they called animal control and he then called me to find out my location. The only thing he did right was show up promptly nothing else from that point was ok in my opinion! The dog was unable to move his back end, the right eye was hanging out of the socket and he had blood coming out of his mouth but still seem to be calm. I petted him and talked to him until his owners could come down. When they arrived I told them I had called animal control and he was on the way. I assured them if they did not feel like they would be able to care for the dog that the officer would put him down. The lady was pretty shaken up after seeing the condition of the dog. Shortly the officer pulled up. The only thing he said is are y’all the owners? They replied. He said do you want the dog or not? No more than she got out of her mouth I don’t think there is anything that can be done for him, the officer took that pole with the loop and yanked that poor dog up off the asphalt and slung him into the cage! The dog was hollering, the lady started screaming and crying, her husband was trying to get her turned around to get her in the truck so she didn’t have to witness anything further. The Officer acted as if was doing them a favor by not charging them to put the dog down… Are you kidding me!! When he arrived and seen the condition of the dog and with their consent that poor animal should have been euthanized on the spot with an injection!! I was completely traumatized by what I had just witnessed. He gave them no warning as to you may not want to watch this or anything! I can guarantee if they had known that was going to take place they would have taken him home and took care of it themselves and I can tell you if I would have known that was going to take place I would have called someone with a gun and would have taken care of it right then and there! NO one should have to watch their animal be treated in this manner and that was NO way to handle and already traumatized, mangled animal that was in pain! This has haunted my mind since January 9th and I think something should be done about this so it’s not to happen to another poor helpless animal nor and animal owner. There needs to be an injection taken and the animal needs to be put down on the spot in such cases as this. If you’d like to contact me please do so. “We’re sorry the family had to witness their animal suffering like that,” said Rowan County Commission vice chair Craig Pierce. “We are aware of it,” Pierce said. Advocates say animal control should have used euthanasia by injection. Rowan County doesn’t have it yet, but Pierce said they soon will. “If we have that on site, then we’re going to be able to give that animal a more humane ending,” he said. The commission says they hope to transition to euthanasia by injection this year. I have reviewed the letter below from Keisha Woodward and frankly I am disgusted by her description of this incident. 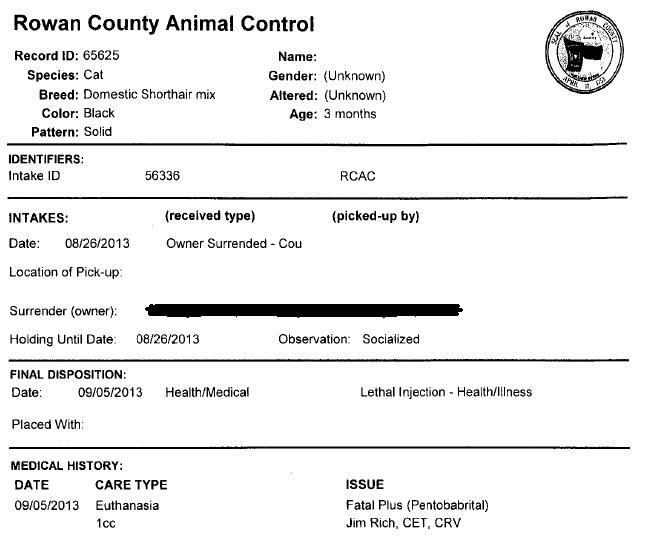 Actions such as those by Animal Control Officer Yaninas are unconscionable and in my opinion (and will be in the opinion of every other animal lover in Rowan County) not repairable by any disciplinary action less than termination. Incidents such as these cause people in the county to not call animal control in situations of neglect and cruelty where they need to be notified. THIS is a situation of cruelty perpetrated by a county employee. What she and this dog’s owners witnessed will stay in their minds forever. As if it were not bad enough to see their dog in such a bad state after being hit by a car what ACO Yaninas did to further this animal’s suffering and that of his owners is truly horrible. Is this the type of person that you want working for Rowan County? Frankly, I believe he should be prosecuted for what he did. This is also, sadly, not the first time that I have heard of such actions by this officer. A euthanasia chamber in a certified facility shall not be operated unless a Certified Euthanasia Technician or a veterinarian licensed in North Carolina and one other adult are present at the time of its use. 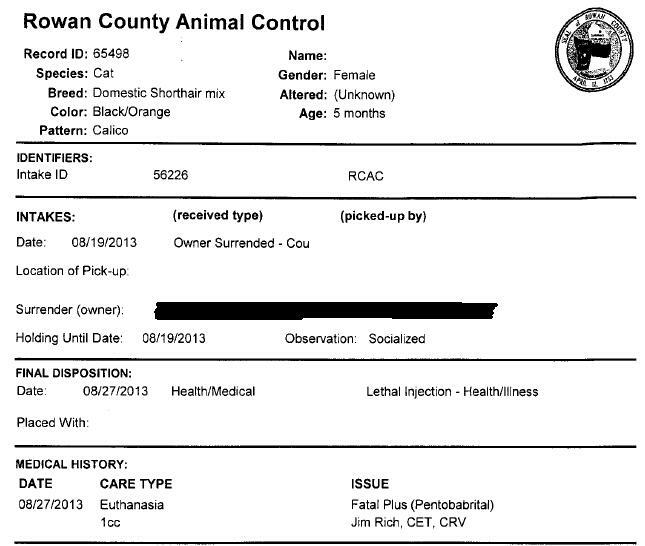 If this employee is not removed from his duties as an Animal Control Officer for the County of Rowan, what is now a private incident will quickly become public. Ms. Woodward and this animal’s owners are both willing to come forward and the media will be contacted. I expect to receive a copy of the letter that is required to be sent to the state of NC when a certified euthanasia technician is terminated by next Friday, January 31st, 2014. This type of callous action towards animals should not and will not be tolerated. And if it is tolerated by the County of Rowan, then all citizens deserve to know that information. A certified facility shall notify the Animal Welfare Section in writing, no later than 10 days from the date of the termination of a Certified Euthanasia Technician’s employment or volunteer status at that certified facility. If you want to contact Rowan Co commissioners regarding Bandit, please remember that respectful letters are far more effective at forcing transparency and reform. Threats of any kind are never acceptable. I’m sorry our broken shelter system failed you Bandit. We need systemic reform now.